As mentioned in my morning routine my night routine is longer than most because I follow the Korean beauty 10-step method. I've been following this process for a couple years and have seen a huge difference in how my skin looks which is why I continue to follow it. 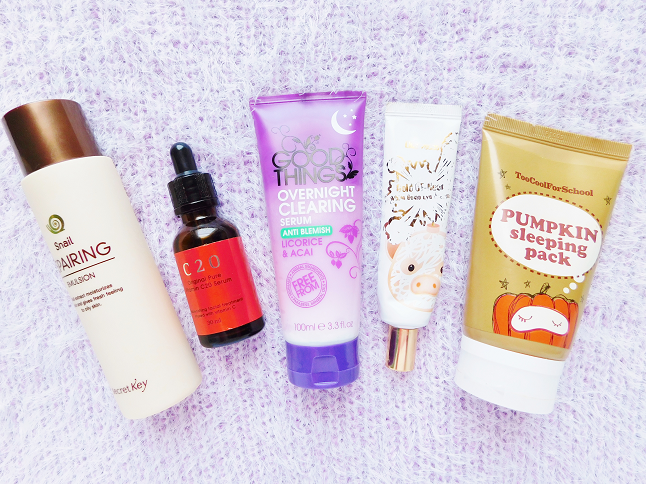 I go through products pretty quickly so I am always switching and using new products. In fact, I'm currently using different products from what's pictured in the photos and these were only taken a few weeks ago! 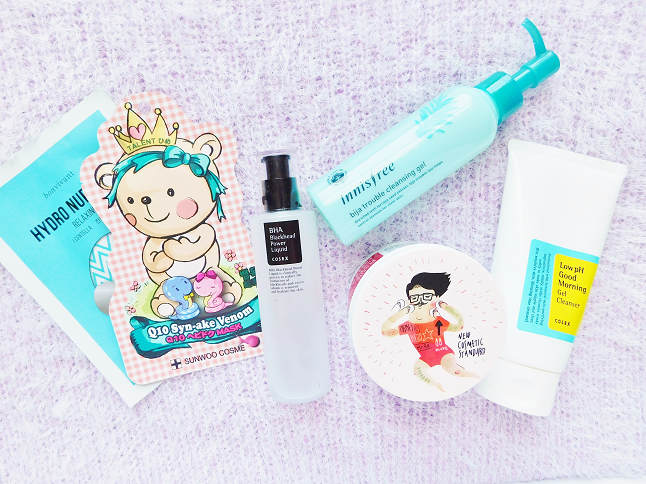 Keep in mind that the 10-step Korean skincare method may not be for everybody but I encourage everybody to at least add one to your skin care routine. If I wore makeup that day then the first thing I would do is remove my makeup with some micellar water. I didn't include the product I use because it's not cruelty-free and I'm still trying to finish it. Double cleansing is something that I never thought was necessary until I read an article on why you should double cleanse, now I use it every time I wash my face! You use a cleansing oil (or gel) to remove leftover makeup residue and sunscreen. Sunscreen is especially difficult to remove so if you use sunscreen daily (which you should!) I recommend you to start double cleansing. Usually, the second cleanser is a foam cleanser but I use gel cleanser instead because gels are lighter and less drying then foam cleansers. Make sure to find the right cleansing products that suit your skin when it comes to double cleansing. These pimple pads have replaced the toner step in my skincare regime. I only use these at night because they are kind of pricey and if I used them at morning and night then I would go through them pretty fast. So I use the Klairs toner in the morning and the COSRX clear pads at night. BHA/AHA liquids are kind of complicated to explain. Let me know if you want me to make a post on the difference between the two. Basically, BHA is a light exfoliate that is suppose to help diminish blackheads. The COSRX is pretty popular but I'm not sure if it works or not. It's now been a year since I've decided to use a sheet mask every night. 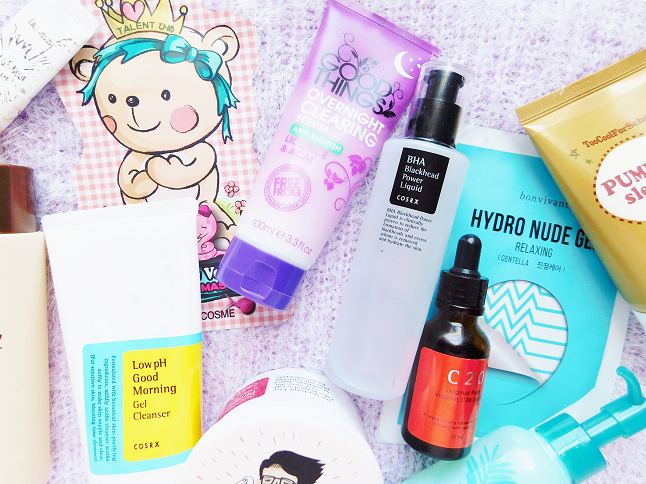 A lot of Korean celebrities swear that using a mask a day is the secret to perfect skin, which is why I decided to start using them daily. I will be posting an updated sheet mask experience post sometime later this month. It's layering time! There are many different products you can use like essence, emulsion, serum, ampoule, etc. 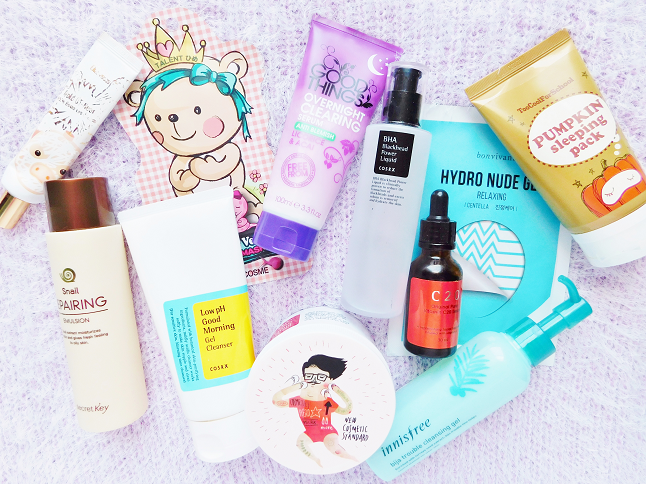 I don't think it's necessary to use all these products in a single routine so I only pick two. When layering skincare products you should do it based on the consistency of the product. It's also important to let every product sink in so that it completely absorbs into the skin. The second layer I am currently using is a vitamin C serum. There are many benefits of using a vitamin C serum such as even out skin tone, whitening, pore tightening, anti-aging, etc. I don't recommend the OST Vitamin C20 Serum I'm currently using because it's thick and sticky, which is why I skip this product every night (Don't use vitamin C serum in the morning btw). I heard that the upgraded C21.5 Advance Serum is way better. I know this is described as a serum but it's so thick that I use it as a night cream instead. Fun fact, in Korea they use the word cream instead of moisturizer. Finally the last step, eye cream. If you are over the age of 20 and don't use an eye cream every morning and night then you should consider it. Eye creams help prevent premature eye wrinkles, fine lines and hydrated your under eye area. This is my favorite Korean eye cream that I use and would recommend it to those that are new to the world of eye creams. On days when I feel like my skin needs extra hydration I apply on a sleep pack. You apply sleep packs/masks at night and wash off in the morning. Back during Winter, I would follow this step every night due to the dry weather but now that it's Spring I usually skip this step now. *I don't follow these steps everyday just when I feel the need to be extra.